This is an interesting one to think about, and I'd love to hear from y'all. I think the main reason this cover fails is because both the title and the main imagery, no doubt meant to be complemetary, are actually fighting for attention. Either tell the story cleverly through taking the title beyond simple type, or render the title simply and give me the payoff in the illustration. Thoughts? Can anyone point me to a cover that does both and is all the better for it? I agree, it feels very unbalanced. I would lose the nuts. 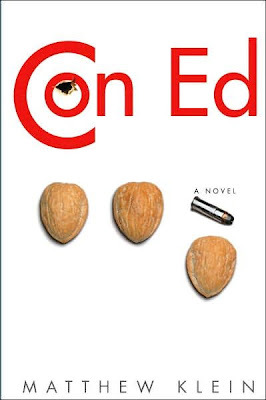 I love how "Con" makes a bull's eye, with the bullet, I think that's enough.